Singapore’s government strongly encourages the use of electronic signatures in legal documents. The corporate services industry – whose key workflows are centered around the creation, review and execution of legal documents – must embrace this technology imminently. The user experience, operational efficiency, cost, and speed improvements are so dramatic that most customers now expect this capability as table stakes. Service providers who do not implement electronic signature will be at a serious disadvantage. CorporateServices.com has integrated e-signatures as a core feature of its business model. Unlike other providers, we do not have to retrofit old legacy business processes to work with e-signatures; instead, our customers will enjoy the simplicity, speed, and cost savings from workflows that are designed from the get-go to use electronic signatures. More business transactions are being done online than ever before. That means speed, efficiency and low cost in executing these transactions become top priorities for market participants. The corporate services industry is very document-centric. Therefore, paper-based document creation and management is a huge barrier to smooth, and efficient operation of this industry. That’s why progressive businesses choose the flexibility of electronic documents. However, without electronic signatures, the full benefits of electronic documents can not be realized. Electronic signature involves creating a secure and accurate identification method for the signatory. The identification information is logically associated with other data in electronic form and used to “sign” a document. An actual e-signature can take any of several forms: clicking an “Accept” button on a website; inserting an electronic facsimile or scan of physical signature on the electronic document; signing using a touchscreen and stylus; or agreeing to the terms and conditions by means of electronic communication, such as email. This flexibility in the execution methods enables businesses to match the method that best meets the needs of their customers. The end result is an expeditious, seamless, and efficient document signing process, saving enormous time and money for the company and simplifying life for its clients, employees and partners. Therefore, it is no surprise that e-signatures are rapidly being adopted across the globe as the figure below shows. Linked to the electronic record to which it relates in a manner such that if the record were changed the electronic signature would be invalidated. CorporateServices.com’s Corporate Services Platform (CSP) is a revolutionary software platform that is designed to simplify the incorporation and compliance of your Singapore company. Striving to deliver superior service for a lower cost, we integrated e-signature capabilities as a core feature of our innovative and easy-to-use platform. CSP intelligently coordinates all tasks related to your company’s incorporation, compliance, immigration, accounting, payroll, tax filings, licenses and other regulatory issues between your company’s stakeholders, our corporate services team, and government services. 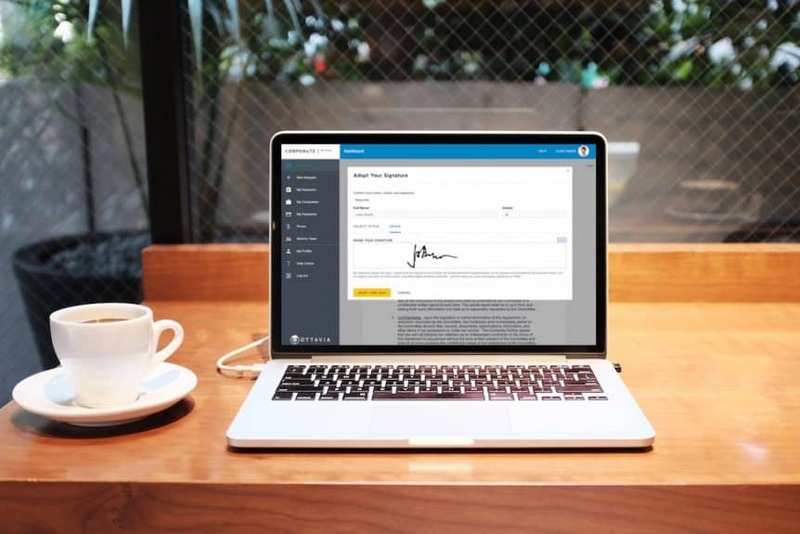 Wherever signatures are required in any task, the platform automatically obtains e-signatures from the right person. Participants simple click on the right buttons, the platform does the rest. First, you will be asked to provide details for all the key persons associated with your company, such as the directors, shareholders and officers. As part of this information, you will also provide an email address for each person. This is the email address that will be used for coordinating the electronic signatures. The CSP system will automatically generate all necessary documents and assemble them into a single “electronic envelope.” Our staff will review and verify the document set. If the identity of the signatory has not yet been verified on CSP, the signatory will receive an email containing instructions for Identity Verification. These instructions will direct the individual to participate in a video call with our staff, during which the person will be asked to show the identification document and the address proof document submitted for them as part of the application. A staff member must be able to confirm that the individual is the same person as shown on the identification document. Once the individual has completed the verification, they can proceed with signing the documents. Verification is required only once. If the identity of the signatory has been previously verified, the signatory will receive an email with instructions for signing the documents and a private link for the signatory to sign the document electronically. The actual electronic signature process is very simple and easy to use. The signatory will see and review the documents that are to be signed. When (s)he is ready to sign, click “Start” to begin signing. The signatory will be able to choose a signature from the proposed options or draw his or her own signature. After that, (s)he simply clicks a button wherever a signature is required. The system will automatically guide to all signature locations and will notify the signatory if any have been missed. It is a very smooth and 100% accurate document signing process. A paperless document flow and storage architecture allows CorporateServices.com to provide fast, reliable and cost-effective service for our clients. E-signatures are an integral feature of our system. Free yourself from unnecessary time loss, manual processing errors, scanning/printing hassles, and mailing costs. 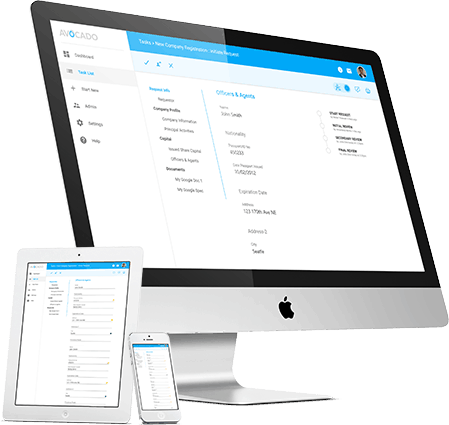 Now you can easily create, review and sign all your company documents, and statutory registers electronically – anywhere, anytime. Experienced team. Affordable cost. Online platform.